Meet Judy Mazzuca, owner of Ink Forest Eco-Friendly Screen Printing and Featured Business Owner at SCORE Chicago this week. Learn how she started and what tips she has for your success. 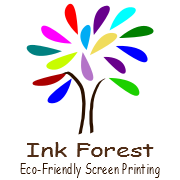 Ink Forest is a Women Owned and Green Certified screen printer in the Chicago area. 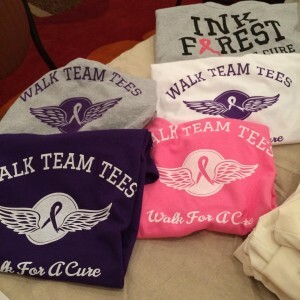 We print custom-designed tshirts, hoodies and fleeces using only water-based inks for both local and national organizations. I had a desire to do something creative. When I started researching screen printing I realized I could do it in a much healthier and much greener way. Water-based inks do not contain PVC’s or phthalates which are found in conventional screen printing inks. We also use only soybean-based solvents locally sourced from Bloomington IL in our cleaning process. This helps to lower our carbon footprint as well. Our clients range from schools to online businesses. Ink Forest offers a safe alternative for children’s clothes. Online businesses appreciate that they can offer their clients products that are healthy and Certified Green. They also like that Ink Forest is women-owned. 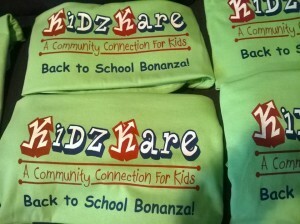 I would say my biggest challenge is marketing; it seems everyone has a “t-shirt guy”. I’m looking to be the new face of screen printing. We are getting the word out that water based inks are healthier. They have a softer and longer lasting print that won’t crack or peel like the conventional inks your “t-shirt guy” uses. What is your Mentor’s name and how they have helped you in your business? Peg Corwin in my mentor and has been invaluable to me. I recently revised my website and I couldn’t have done it without Peg’s insight to SEO. She is always there when I have a question. Call Score and ask for help, attend their seminars and network with like-minded people.